It’s easy to find, just as you enter the city through Kyrenia Gate you will notice a domed building on your left hand side, this is the museum. You go in through the front gate to the left of the building, where you will find the ticket office. Built in the 17th century Mevlevi Tekke was home to the religious order dedicated to the Sufi movement, which is a practice and tradition which embraces the inner and more mystical side of Islam. The practice was originally said to have been founded by an ethnic Afgan by the name of Celaleddin Rumi who was born in 1207, he was a young professor whose family had immigrated to Konya in Anatolia when he was 24. The Sufi movement was to sweep across the Islamic world in years to come, and is still practised far and wide today, although Atatürk banned it in Turkey in 1925. What is particularly interesting about the movement in North Cyprus is that the British powers allowed the tradition to continue, it being the ruling colonial power on the island at the time. The tekke in Lefkoşa is a fascinating insight into the life of the movement which really is only understood once you have heard some of the sayings that were preached, such as “behold, joy and a splendid future belong to those who believe and perform good deeds.” The tekke was used as a centre for the poor and needy, with food and shelter provided for the homeless and orphans. Apart from its religious practices therefore, the role of the Mevlevi movement seems to be totally dedicated to providing for those unable to look after themselves. You may also hear them being referred to as ‘dervishes,’ this is a Persian word and this name is given to followers of Sufism. The building has been substantially changed over the years, but there are some wonderful prints to look at which show the building how it was in the past, these include views of the main road which is now extremely busy! But imagine a dirt road on entering through the Kyrenia Gate instead of the tarmac road there now, and imagine donkeys and carts instead of cars and trucks! The tekke finally closed in 1961 and experienced some changes subsequently, particularly in 1970 when a lot of it was sadly demolished to build a shopping centre, before it opened as the museum in 2002. Firstly we suggest you take a look around the courtyard which has some interesting Ottoman lapidary to see. Then, once in the main building you will be introduced to the various readings of Rumi including his most famous poem the ‘Mesnevi.’ Inside you will also find the main dancing area of the ‘whirling dervishes’ and balcony that musicians would have used to play for them. 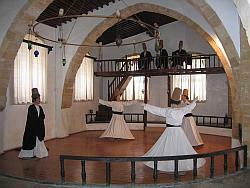 Today models give you an insight into the costumes worn by the dervishes and the dance they performed. 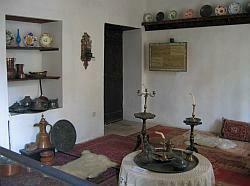 There is also a kitchen to see, which was the most important place within the tekke. Every year on December 17th the whirling dervishes still perform their completely mesmerising dance in remembrance of Rumi’s death, this is known as the ‘Wedding Night’ when Rumi was reunited with God. 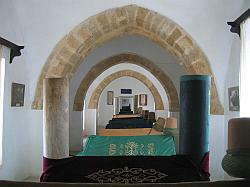 Perhaps most interesting of all is the chambered corridor which houses tombs of the various sheikhs of the Mevlevihane. There are sixteen in total, with the chambers running alongside the main road, but amazingly it is the most peaceful and tranquil place! Each tomb is covered in colourful embroidered cloth with a fez type hat atop. You can find various artefacts and manuscripts from some of the sheikhs who were bought to Cyprus from other regions around the world where Sufism was practised, they were effectively the overseers of the movement here. Apart from the fact that the Mevlevi Tekke is now a museum it really does give you a sense of peace and calm, and should you be in Lefkosa on a hot day it’s a great place to spend some time to cool down and experience its uniqueness. 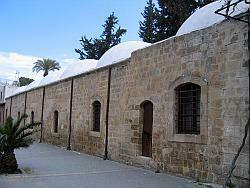 Mevlevi Tekke Museum is open from 09.00 – 16.30 daily at the time of writing and entrance costs 5TL.